We all deserve a little pampering especially this time of year when it’s cold outside and Valentine’s Day right around the corner. I know I always feel so much less stressed when I take a little extra “me” time. Reading a good book, relaxing in a hot bath with candles or getting a massage- there are so many ways for us to “de-stress” and unwind. I want to tell you all about Earthworks– a body care company that will help you look and feel beautiful and provide you with a luxurious bath experience. Through the development of Pur-Essences, they have been able to capture not only the fragrance, but also the mood and feel behind each scent. From Sweet Lime to Grapefruit to Hazelnut, you will be able to find a fragrance that is right for you. Their product line includes Bath Oil, Body Lotion, Soap, Shower & Bath Gel, Eau de Perfum, Bath Truffles, Gift Sets, Hand Cream, Hand Wash and Room & Linen Spray. 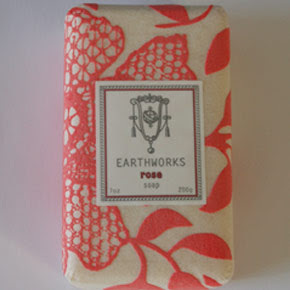 Earthworks sent me two products to try- Rose Soap and Rose Hand Cream. The Rose Soap really does smell like freshly cut roses. I could close my eyes and smell this soap and I could easily be fooled into believing that I had a dozen roses right under my nose. Red roses are my favourite flower so this soap was a delight to try! It is a triple milled bar made in England made with shea butter, jojoba oil and coconut oil. You get 7oz for $11 and it is quite a large bar of soap. I love how it makes my skin feel so smooth and soft. I also tried the Hand Cream in Rose Pur-Essence and it smelled just as lovely as the soap. It is super moisturizing and soothing to my dry, cracked hands and cuticles. I also like that it absorbs in almost immediately and leaves no greasy residue. It is a good size tube at 120 ml for $16. I would definitely be interested in trying other products from Earthworks in some of the other Pur-Essence fragrances. Rose was awesome, but I have a feeling that the other ones will be just as great!